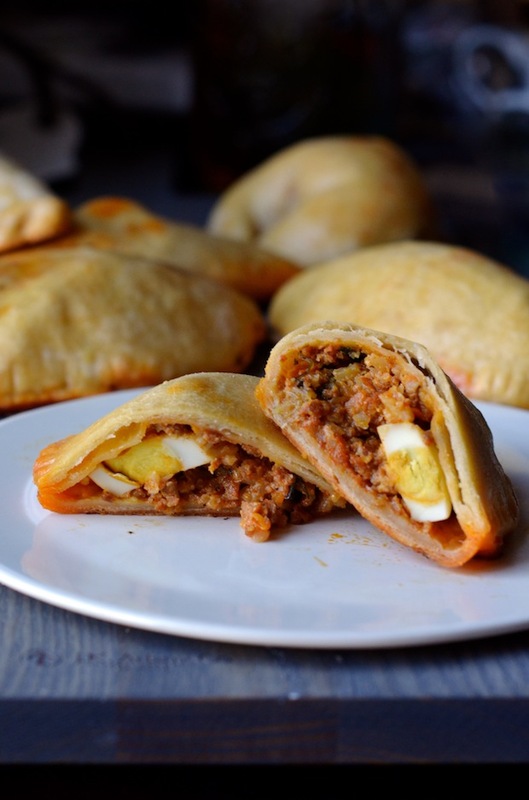 Empanadas have long been one of my favorite savory snacks. A delicious dough-y package filled with goodness? Yeah, it's tough to go wrong. 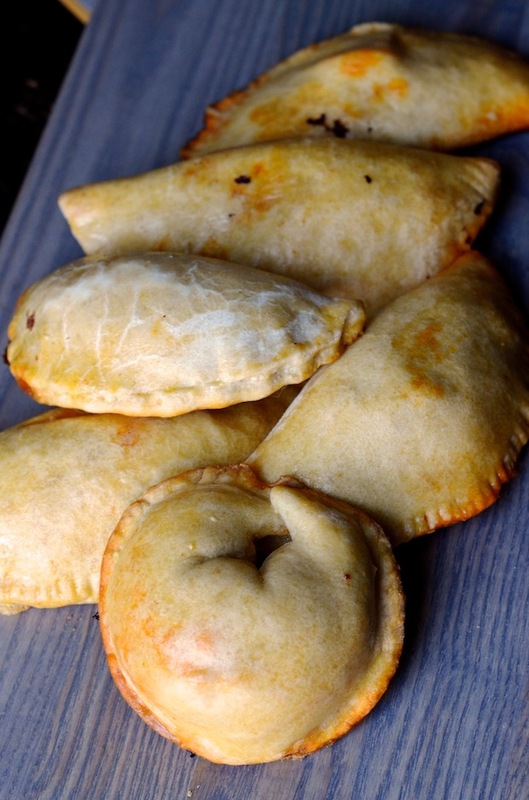 I grew up eating the Puerto Rican kind, which are called pastelillos, and typically made from a fried chewy crust stuffed with a variety of fillings (everything from ground meat to sweet guava paste). Cheese was usually my favorite, and when my mom made them, I would camp out near the stove stealing them as they came out of the pan. One of my best friends in high school was Colombian, so at her house, we ate crispy little yellow empanadas made with a thick corn dough, often served with a spicy dipping sauce. I also loved the pastelitos sold at the bakeries in the nearby Cuban neighborhood. Those were flakier with more of a puff pastry-like dough, and I usually went for the sweet versions filled with guava paste and topped with a sticky glaze. As I grew older, I got to taste more and more, and recently have grown quite smitten with Argentinian style empanadas. Unlike the ones I grew up with, these are typically baked, and made with an easy soft dough that is a cinch to prepare at home. I don't like to do much frying in my kitchen because I don't have a hood over my stove (read: the entire apartment smells like grease for dayzzzz), so a baked empanada is TOTALLY my style. 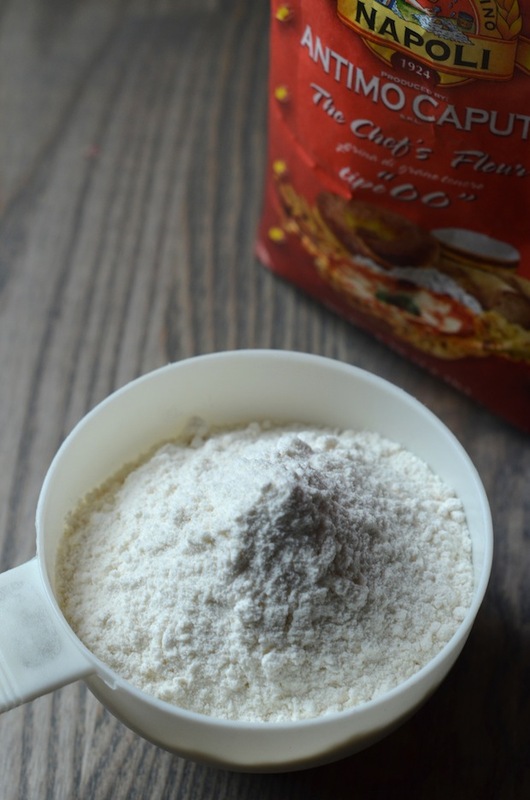 While you can definitely use regular all-purpose flour for this dough, I would recommend trying to find Italian "00" flour (easily available on Amazon or specialty cooking stores), which is a finely milled flour that's amazing for making things like pizza dough and bread. It produces a crust that is the perfect mix of chewy and crisp--totally worth it if you can find it! It's a little bit of a lighter twist on the more traditional filling, which usually combines potatoes with the sausage. As for the crimping, I have to confess that this has never been my strong suit. I seriously just don't have the patience for the traditional twists and folds--I'll do it for a couple, and then just use a fork to crimp the rest. It makes absolutely ZERO difference to the flavor, so don't stress about it too much. Let me know what you think about these if you try them! Post a pic on Instagram or Twitter and use the hashtag #alwaysorderdessert. Can't wait to see your creations! 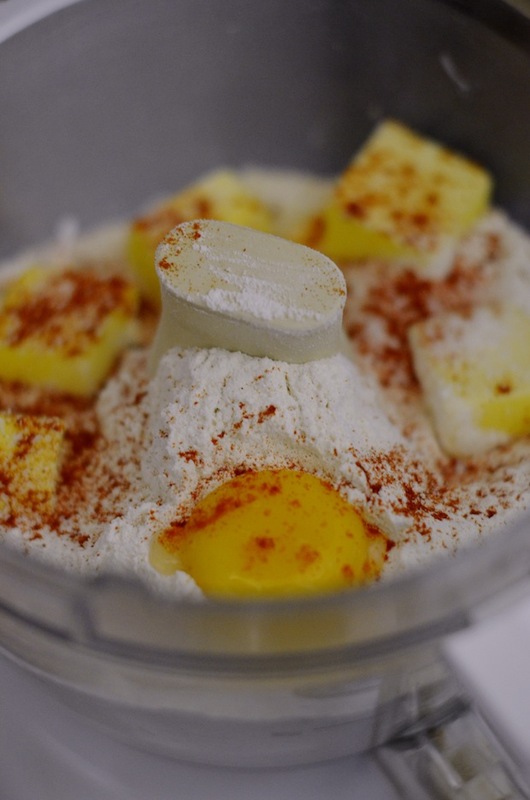 First prepare the dough: combine flour, salt, and paprika in a food processor and pulse to combine. 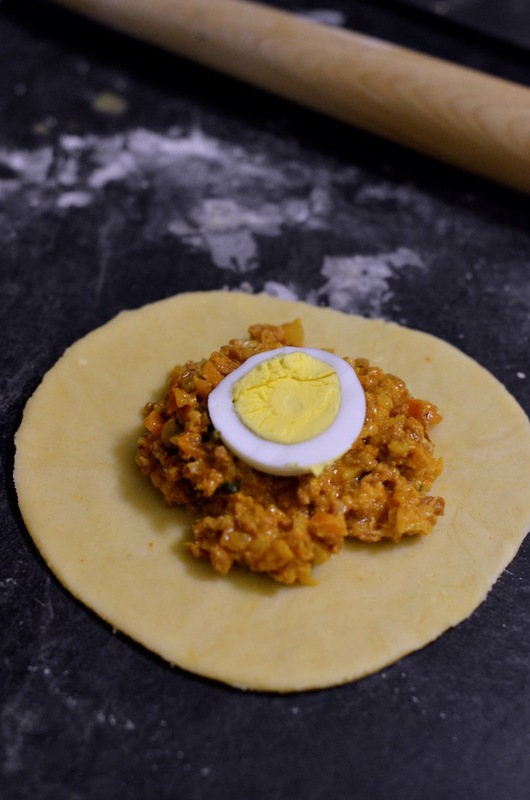 Add the butter and egg yolk, and pulse again until evenly combined. Turn on and slowly add the cream until the dough comes together in a large ball (you may not need all the cream). Remove dough from food processor, divide in half, and form into a disc. Wrap each disc in plastic and chill for at least 30 minutes while you prepare the filling. Prepare the filling: Place chorizo links in the food processor and pulse until coarsely chopped. Set aside. Heat oil in a large skillet over medium heat and add the onions and chorizo. Saute for 2-3 minutes, then add the cauliflower, carrots, and broth. Bring to a boil, then lower heat and let simmer until vegetables are very tender and most of the water has evaporated. Remove from heat and stir in the baby spinach (the heat from the meat will wilt the spinach). Let cool to room temperature. Remove dough from the fridge and working with one disc at a time, roll it out to about 1/8" of an inch thick. Use an upside-down bowl to cut out rounds about 5-6 inches in diameter. Bake 20 - 25 minutes, or until puffed and golden. Serve hot. 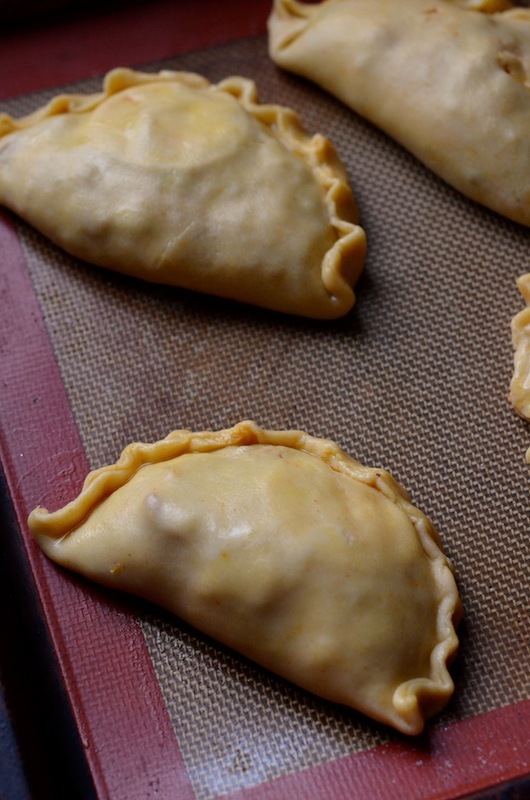 Make-ahead Note: You can also freeze the unbaked empanadas for baking later.